Alfred Barye (1839 – 1882) was born in Paris, France, the son of Antoine Louis Barye the famous Animalier sculptor, on January 21st 1839. Alfred was an accomplished artist and sculptor in his own right, but for his entire career he worked in the shadow of his much better known and more famous father. Alfred apprenticed under the tutelage of his father and expertly learned the art of bronze sand casting at a very young age while working along side his brothers in his father’s studio and foundry. Because of this early first hand knowledge of foundry techniques, his bronze sculptures show a very high degree of detail, workmanship, and finish to them. Many of his earliest works, done as a young man, are small casts of wild animals, which show the strong influence and teachings of his father. His most successful and numerous subjects were the racehorses of the day, but he is known to have modeled many works in the style of his father as well as in a style that is typically his own. He signed many of his sculptural works Barye or A. Barye, the same signature that was used by his father. This causes as much confusion today as it did during his lifetime and many of Alfred’s models are mistakenly attributed to and sold as his father’s works. After much family disagreement and at the insistence of his father, he began signing his work Alf. Barye, and later A. Barye Fils. It has been suggested but never confirmed that Alfred Barye was responsible for quite a few unauthorized life time casts of his father’s works. It is a documented fact that Alfred Barye continued casting his father’s models after his father’s death. There have also been some bronze sculptures reported that appear to be those of Antoine Louis Barye but bear the signature Alf. Barye. Through most of his life he was in constant conflict with his father. At times he worked in his father’s studio, and the two artists set aside their difficulties, but there were also times where neither man spoke to each other, sometimes for years. Although not as dedicated to art as his father, it cannot be disputed that Alfred Barye is a master sculptor in his own right and recently his bronzes are accorded the respect, admiration, and values that they truly deserve. 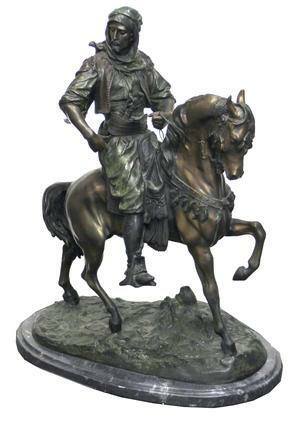 In 1864 he exhibited a bronze sculpture of a Racehorse titled Walter Scott. In 1865 he exhibited several bronze sculptures of racing horses. In 1866 he exhibited a bronze of a Racehorse and Jockey.